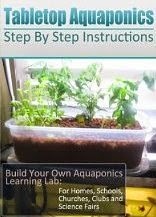 This book teaches you how to build a tabletop aquaponics system for homes, classrooms, clubs, churches, and science projects. For a few hundred dollars (or less, if you're a decent scrounger), this tabletop aquaponic system will provide hours of fun and learning during its construction and set-up, while promoting responsibility in caring for the fish and plants as they grow. And your bonus is getting to eat the vegetables that are produced! Aquaponics will be of increasing Importance to the future of food production, using only 10% of the water of conventional agriculture. High quality healthful food can be produced efficiently in small spaces. Aquaponics also allows fish farming without the need for discharging toxic water into the environment. So both fish and vegetables are produced in a healthful local environment, avoiding the long distance transportation of food. Experimenters will learn how aquaponics works, how fish feed the plants and how the plants clean the water for the fish. The project is fun, and doesn't require prior knowledge. Fresh plants for the kitchen can be grown as a hobby, and as a fun learning tool for chemistry, botany, ecology, physics, math, and general science. Goldfish and koi can be substituted for food fish. Hydroponics and aquaculture are explained, along with their advantages and disadvantages. You will learn how their combination into the art and science of aquaponics provides the benefits of both without some of the serious problems associated with each of them alone. This book can be used to create a variety of science projects, investigating many aspects of food production. Suggestions in the book include the importance of the quality and quantity of light, water chemistry, fish nutrition and health, and many other aspects of aquaponic science. Or the science can be ignored and you can just enjoy the fresh basil, Swiss chard, cilantro, peppers, and tomatoes you are growing in your home! Plus having the pleasure of an aquarium of beautiful fish that never needs the water changed and never stinks!